In the nineteenth century, Dr. Victor Frankenstein brought his notorious creation to life, but a horrible turn of events forced him to abandon it and slip away from the public eye. Two centuries later, a serial killer is on the loose in New Orleans, gruesomely salvaging body parts from each of his victims, as if trying to assemble a perfect human being. Detective Carson O’Connor is cool, cynical and every bit as tough as he looks. Her partner, Michael Maddison, would back her up all the way to Hell itself—and that just may be where their new case ends up. For as they investigate the strange killings, O’Connor and Maddison find themselves drawn into a weird underworld of deception and secrets where a man named Victor Helios has created an entire race of perfectly engineered people who are meant to take humankind’s place one day. But something is happening to some of Helios’s creations, and it may be that this bizarre serial killer is the least of the detectives’ worries. 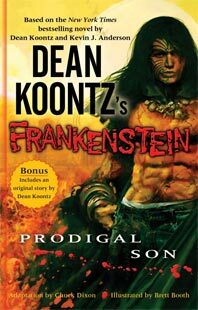 From the masterly pen of New York Times bestselling author Dean Koontz—and featuring an adaptation by legendary comic book writer Chuck Dixon and gorgeous illustrations by acclaimed artist Brett Booth—Dean Koontz’s Frankenstein: Prodigal Son is a story filled with fast-paced action, gripping horror, and thrilling adventure. The graphic novel includes an introduction and the added bonus of an original story in comics form by Dean Koontz. The story will continue in Volume 2.